Last week marked the start of the U.S. Department of Energy Solar Decathlon 2013 in Irvine, California, and 19 teams have completed a spectacular array of solar-powered homes for the competition. 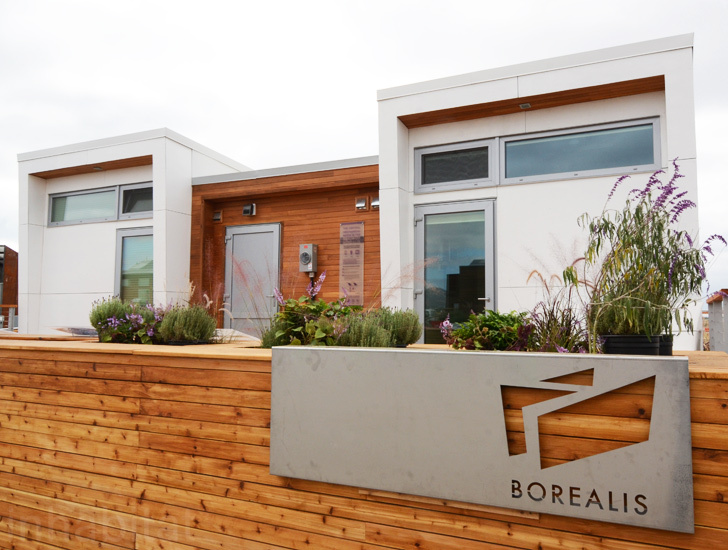 Especially stunning is Team Alberta's Borealis Home, which is a prefabricated modular home designed as a solution to the lack of housing in remote areas. The net zero energy house features an amazing living wall on the interior of the home that filters air and promotes the idea of healthy living through design. Read on to see our photos of Team Alberta's incredible solar home and find out the latest from our team reporting live from the Solar Decathlon! 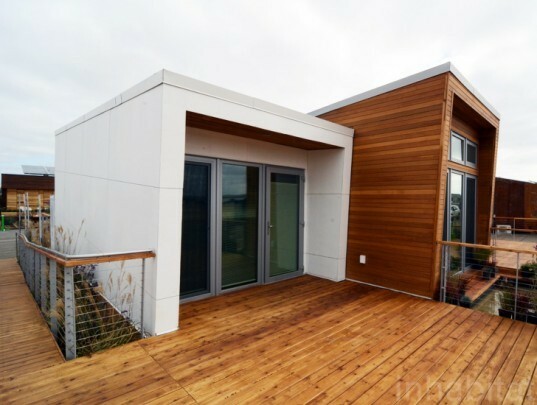 As we move into the first official week of the Solar Decathlon 2013, the judges are beginning to make their rounds of the 19 beautiful ultra-efficient solar homes. Although all of the designs are incredibly impressive this year, there are quite a few that stand out for not only their innovative energy-saving features, but also for their unique resilient design. Team Alberta has bought a very strong entry to the competition with the the Borealis House, which was created to provide sustainable solutions to the many modern infrastructure needs of remote communities. For years, forestry mining and energy companies have moved into Alberta looking to take advantage of the region’s many natural resources. This massive influx of commerce has caused a severe shortage of available and affordable housing in the area, resulting in poor choices for employees and families living in the closed-off areas. With their Borealis Solar Home, Team Alberta, offers an inspired solution to these housing issues caused by over development, which has recently taken place not only in Alberta, but in multiple resource-rich areas around the world. Created by students at University of Calgary and Mount Royal University, the prefabricated, modular home is a sustainable answer for cities, companies and families who need to find housing in remote areas around the world. As a matter of practicality, Borealis is easily transported and assembled and is especially adaptable to harsh climate conditions, making it an affordable and practical option for temporary housing. The flexible and efficient building method is a key feature for international companies as well as employees that tend to move along with available, yet transient, employment opportunities. The Borealis house is made up of a steel substructure with R-40 walls that insulate the house from chilly weather. Heat is provided by a smart energy recovery system that stores and uses waste heat for dehumidification and heating. The fully automated control system allows residents to cool and heat the house as the local climate dictates. Along with a rooftop 10 kilowatt photovoltaic array, high velocity installation and solar thermal tubes, the temperature regulation features make the Borealis house a zero-net energy home. The three-module home offers a comfortable and flexible living area that is designed to meet the distinct needs of its residents. A shared service core includes the kitchen and dining room, the bathroom and the mechanical room. This core is flanked by two residential modules on either side that allow for a flexible living arrangement. Two bedrooms can be found on one side of the core and the living and office space on the other. The modules are separated by frosted sliding doors that lead into the shared core area, providing residents with privacy options as well as an open concept living set-up. 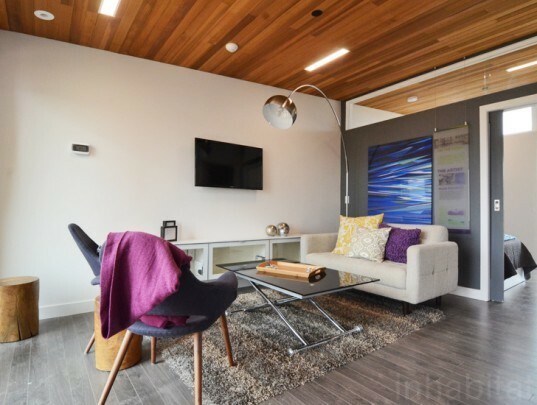 The gorgeous and highly efficient Borealis home offers a resourceful and sustainable alternative to housing issues found around the world, and it also puts an emphasis on interior healthy living. As the design is meant for remote areas with extreme climates, it’s necessary to provide a healthy interior atmosphere where outdoor activity may be limited. 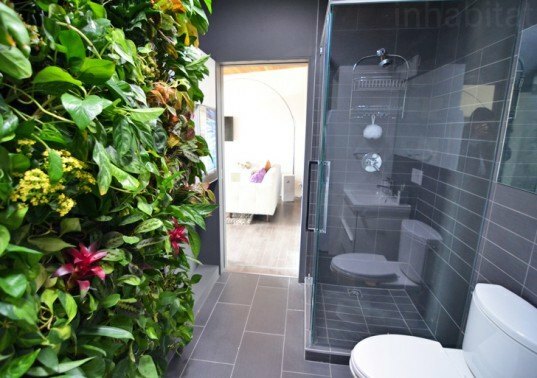 And as a conscious effort to create an optimal living environment, Borealis has installed an indoor living wall right in the bathroom. Multiple skylights allow the vertical garden to grow year round as it provides natural air filtration to improve the air quality of the interior. As officials make their judging rounds this week, it’s clear that this year’s competition is going to be an exciting one. 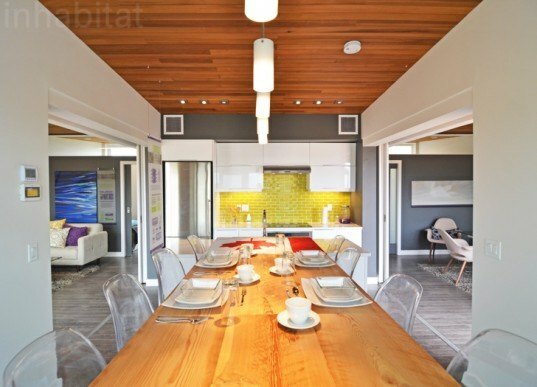 Keep up with Inhabitat’s live coverage to see which houses are the ones to watch! The three-module Borealis home opens up into a large patio, merging the interior living space with nature. The home offers a comfortable and flexible living area that is designed to meet the distinct needs of its residents. The Borealis living wall filters air and adds to the healthy living aspect of the home itself. The operational systems are all stored in one area. Heat is provided by a smart energy recovery system that stores and uses waste heat for dehumidification and heating. The fully automated control system allows residents to cool and heat the house as the local climate dictates. The kitchen serves as communal middle ground and is flanked by two residential modules on either side that allow for a flexible living arrangement. The three-module system provides room for a living space, two bedrooms and an office, plus the shared core area. The modern kitchen serves as the heart of the living areas. Skylights let light into the bathroom, which has a large floor-to-ceiling living wall. The patio is accessible by each three modules and allows residents to take advantage of moderate climates. 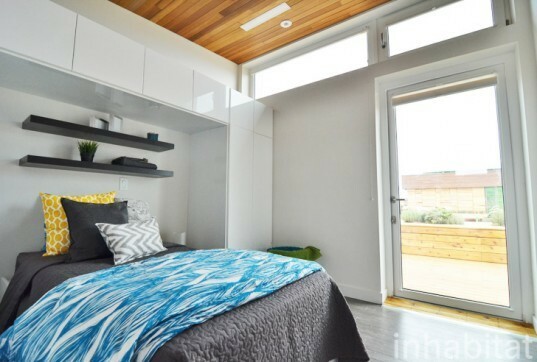 The modules are separated by frosted sliding doors that lead into the shared core area, providing residents with privacy options as well as an open concept living set-up. Gone are the days of temporary warehouse-like housing units; Borealis provides a warm, welcoming environment that Team Alberta describes as "the perfect backdrop for a beacon of comfort, sustainability and harmony." The purpose of the Borealis Home is to provide sustainable solutions to address the many modern infrastructure needs of remote communities. The Borealis house is not only a functional alternative for scarce housing in remote areas, but it's also impressively forward-thinking aesthetically as well.